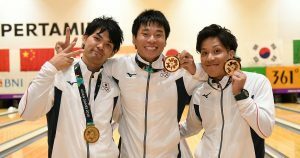 Shogo Wada, Tomoyuki Sasaki and Shusaku Asato of Japan set three championship records on their way to successfully defend the men’s trios title in the 18th Asian Games at Jakabaring Sports City bowling center in Palembang, Indonesia, Thursday. 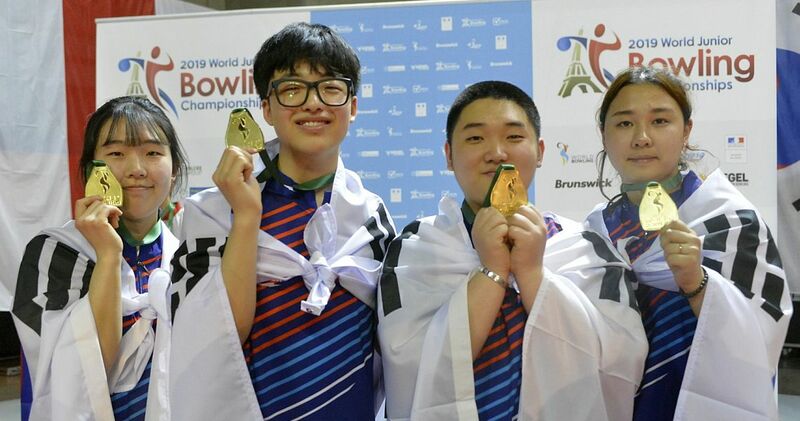 Wada, Sasaki and Asato (left, l-r), who won the trios title in the 2014 Asian Games in Incheon, Korea, with 3881 total and an average of 215.61, topped the field of 31 trios with record 4344 total and an average of 241.33. 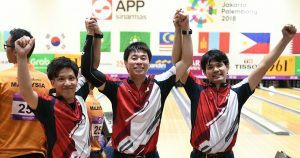 The Asian Games Jakarta Palembang 2018 are the first major championships which are using the relatively new World Bowling Scoring System. 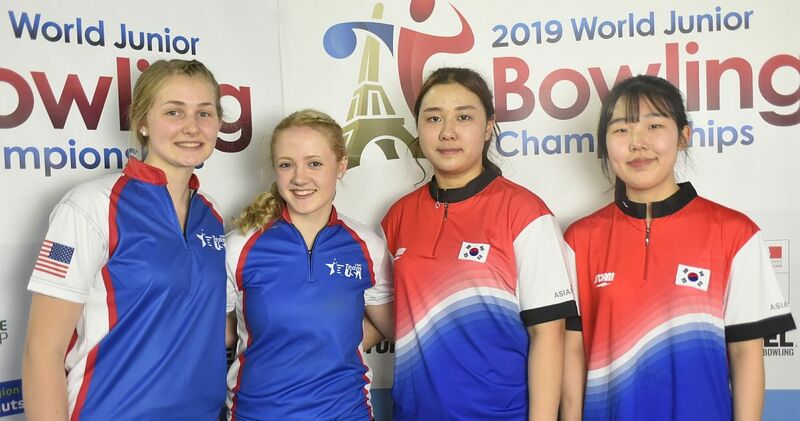 The World Bowling Scoring System maintains the traditional 10-frame format but awards 30 pins for a strike, 10 pins for a spare plus the pinfall of the first shot in the frame, and actual pinfall after two shots in case of an open frame. 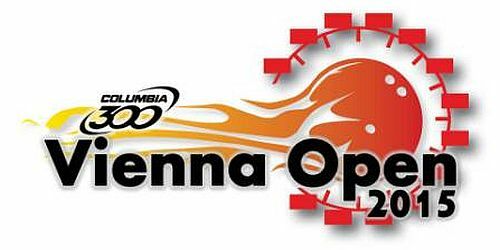 The defending champions took an 88-pin lead after the first three-game block on medium oil with record 2286 (254.00 average), setting a record for one game in game two which was re-broken in game with 798. 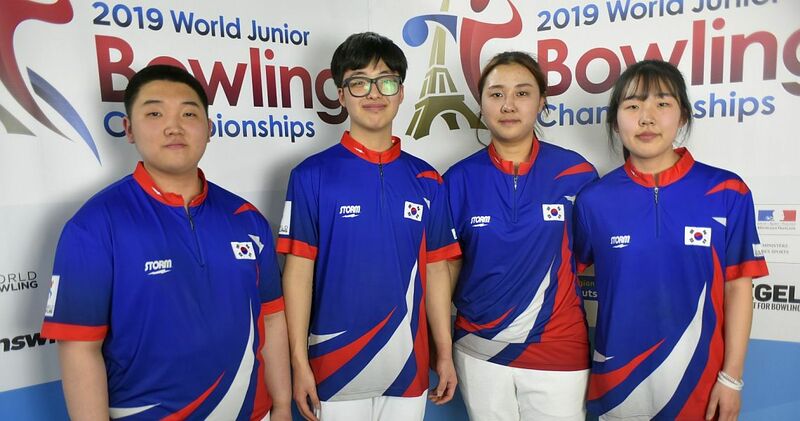 The Japanese widened their lead to 109 pins in the second block on long oil with 2058 (228.67) to cruise to the gold medal. Asato (on the left) led the way with 1545 (257.50), including a 300 in game three. 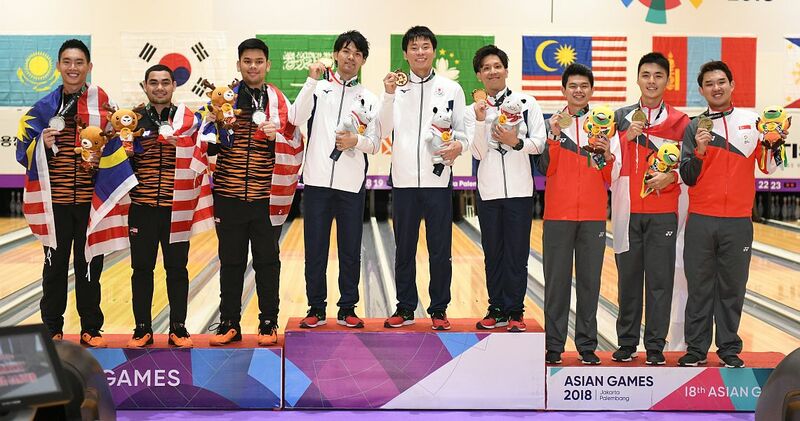 He became just the second bowler in Asian Games competition who accomplished the feat. Choi Bokeum of Korea, who is on the Korean team in Palembang, rolled the first 300 game in the 2010 Asian Games in Guangzhou, China. Wada (right) had 1407 and Sasaki (middle) got 1392. 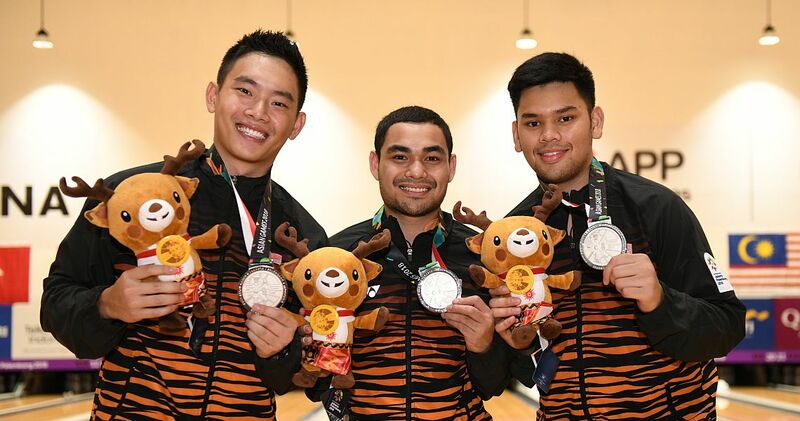 Timmy Tan of Malaysia, who was on the trio that won the silver medal in 2010, teamed with Ahmad Muaz Fishol and Muhd Rafiq Ismail (left, l-r) to win another silver medal with 4235 total and an overall average of 235.28. The Malaysians closed with a huge 751 game to leap from fifth to second place with 2151 for the last three games, the highest block on long oil, to beat out Singapore for second place by mere nine pins. 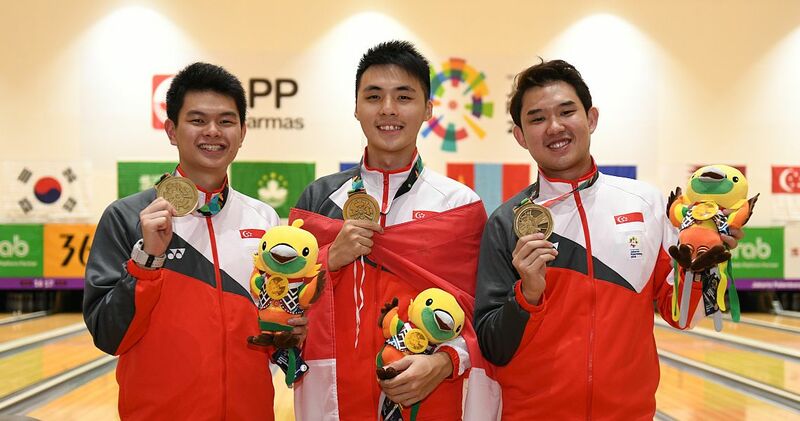 Darren Ong, Alex Chong and Muhd Jaris Goh (right, l-r) finished with 684 to secure the bronze medal for Singapore with 4226 (234.78). Hardy Rachmadian, Ryan Lalisang, Billy Muhammad Islam (left, l-r) from the host country Indonesia posted high games of 763 and 723 in the fourth and sixth game, respectively, but a 615 in game five was a setback that proved costly. The Indonesians fell 36 pins short of the medals to finish in fourth place with 4190 (232.78). The top 11 out of 31 trios broke the old six-game record of 4089, which was based on the traditional scoring system. 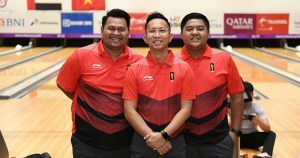 The bowling competition will be held August 18-27 in the bowling center inside Jakabaring Sport City also known as Jakabaring Sport Complex (Indonesian: Kompleks Olahraga Jakabaring), an integrated sports facility complex near Palembang, featuring 168 bowlers – 99 men and 69 women – from 18 countries. The bowling comptition will be contested on two lane conditioning pattern, a medium and a long oil pattern. Kegel’s John Janawicz is managing lane maintenance. 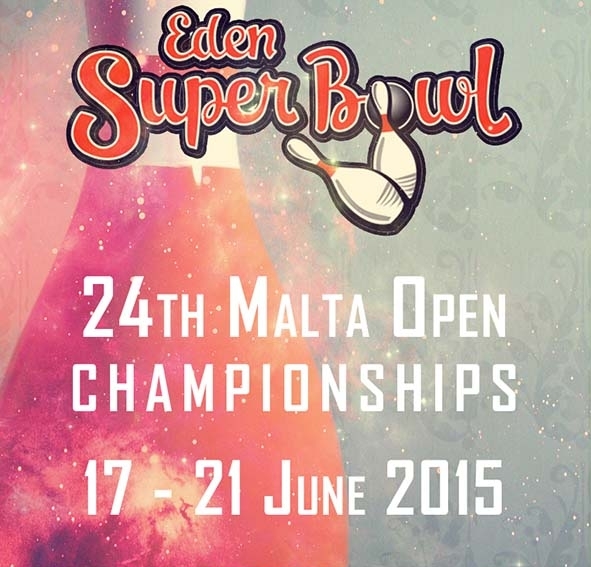 The Team of 6 events will be contested on August 24 (women) and August 25 (men). 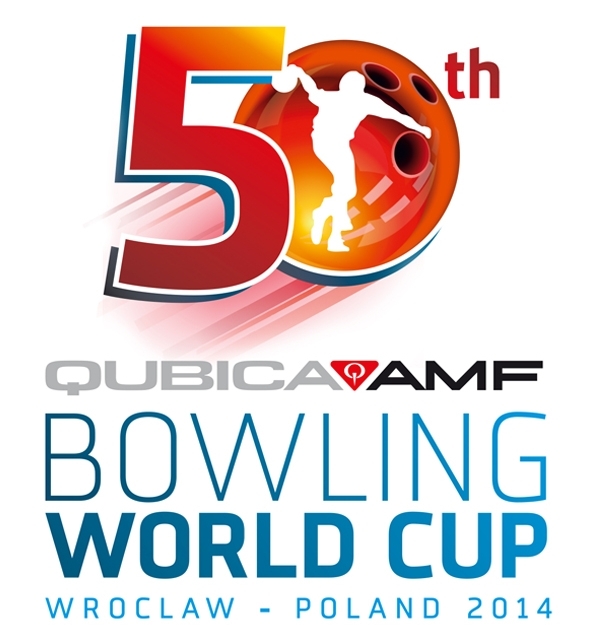 All players bowl two blocks of three games with the six-game total determining the medalists. The South Korean men and the women from Singapore captured the gold medals in 2014. The top 16 men and top 16 women based on the 12-game total pinfall in trios and team, but only maximum two from each NOC, will qualify for the masters finals on August 26 and 27. The top 3 men and top 3 women after 16 games of round robin match play advance to the stepladder finals. 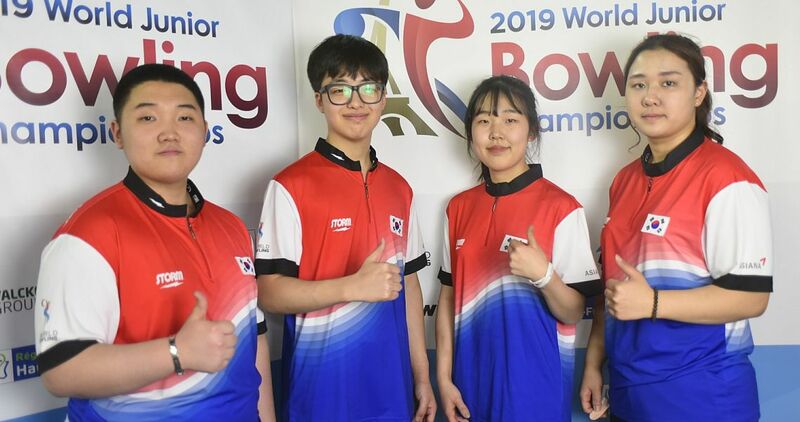 South Korea’s Park Jong Woo and Lee Na Young are in Palembang to defend their titles. 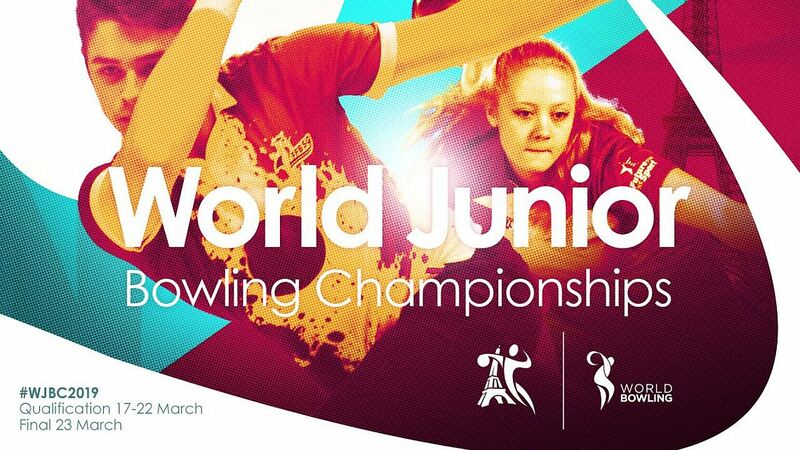 Scores based on the World Bowling Scoring System. 300 games (1) – Shusaku Asato. « Did Anthony Simonsen unveil the next evolution of bowling techniques?